For over a decade, people have been inspired and motivated by the words of Mr. Aric Jackson. His mission is to Teach, Inspire, and Encourage all those who hear him, and to take the challenge of helping others pursue their goals and dreams. 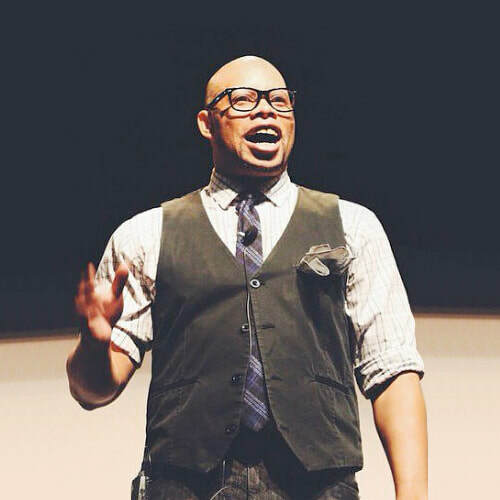 A charismatic and genuinely heartfelt communicator, Aric truly electrifies an audience. Watching him speak on stage helps you realize why he is such a unique and gifted orator. For it takes a genuine speaker to present information with shared experience, passion to research a topic much deeper, and to share that information with the audience using skills that will make it a memorable and exciting experience for all. Aric has he served as a student leadership speaker for organizations like Future Business Leaders of America, Health Occupation Students Association, DECA, FCCLA, National Association of Secondary School Principals LEAD Conferences, and many Statewide Student Council Conferences across the country. Michael’s new bestselling 2018 book is called Growing Great Qualities in Kids: The L.A.S.E.R.B.E.A.M. Technique for Bringing Out the Best in Young People. Michael (michaelbrandwein.com) is the national award-winning, number one best-selling author for staff training and supervision; his six books include Training Terrific Staff, Super Staff SuperVision, Skill of the Day: What Great Leaders of Young People Do and Say, and Learning Leadership: How to Develop Outstanding Teen Leadership Training Programs at Camp. He’s presented in all 50 states and on six of the seven continents. Michael wrote and presented three Emmy® award-winning television programs on communicating with children. Michael is a frequent trainer for individual camp staffs throughout North America. In 2017, Michael keynoted the International Camping Congress, the global conference held in Russia for 1,250 camp professionals from over 30 countries. He is a frequent staff trainer for individual camps and organizations and a keynote speaker for national organizations including the American Camp Association (ACA), YMCA of the USA, and the National Recreation and Park Association. Michael has served on the national board of directors of the ACA. He lives in Chicago with his wife Donna and their two sons, both educators. networking. With 17 years of experience in working for Fortune 500 companies, Denise has honed the ability to deliver and receive messages across language, cultural, and communication-style barriers. She has served and been recognized for excellence in leadership from companies including Toyota Motor Manufacturing Indiana, PepsiCo, General Electric and MillerCoors. Northwestern Mutual and Stanley Black and Decker. Organizations she’s consulted and coached include the National Black MBA Association, Thurgood Marshall Leadership Institute, and the Boys and Girls Club of Greater Milwaukee. Journal as a 2019 Milwaukee Top 100 Power Broker. two future leaders, her daughter Dominique and son Daren.